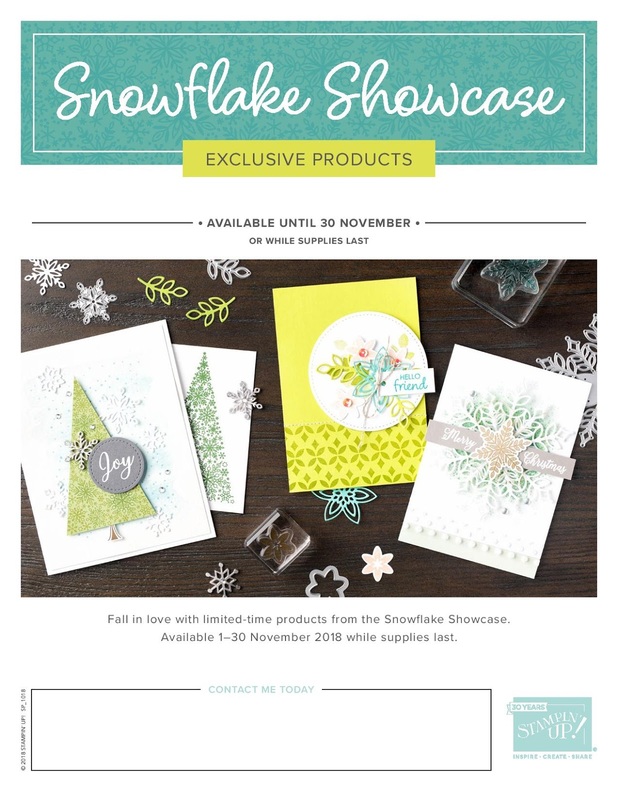 Hello and welcome to another blog hop featuring the gorgeous Snowflake Showcase suite of products which are now live to everyone to order for this month only! The Artisan team are sharing a whole heap of great ideas using this fantastic bundle in this hop, so be sure to hop along and get some inspiration for using these amazing products. I will confess...I wasn’t much of a snowflake lover, but after playing with these products, I think it’s safe to say that I now am! 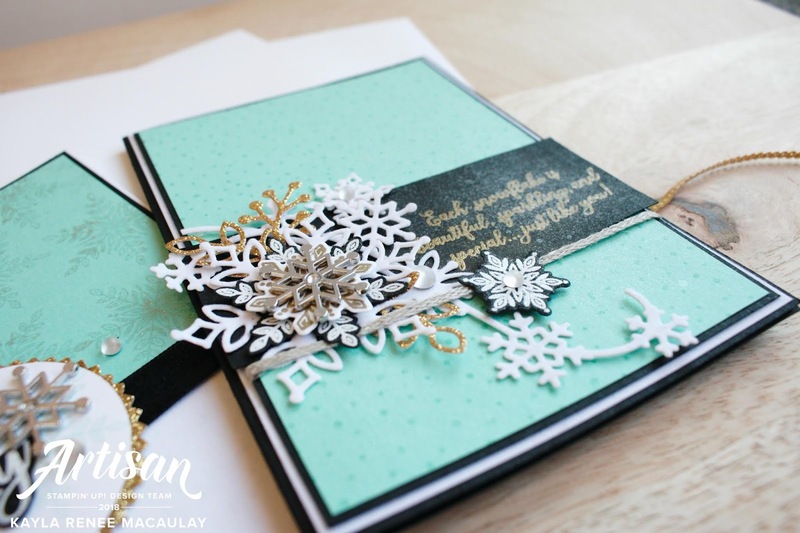 And that White Velveteen paper is just Ah-MAZING! Here’s a look at the completed set of two cards that I made. I really enjoyed combining these fun snowflake products with the really super awesome Champagne Mist and Frost White Shimmer Paint. On the left I actually stamped that card with the Champagne Mist Shimmer Paint. It’s really easy to do - simply use a sponge dauber to apply the paint to the stamp and stamp away! 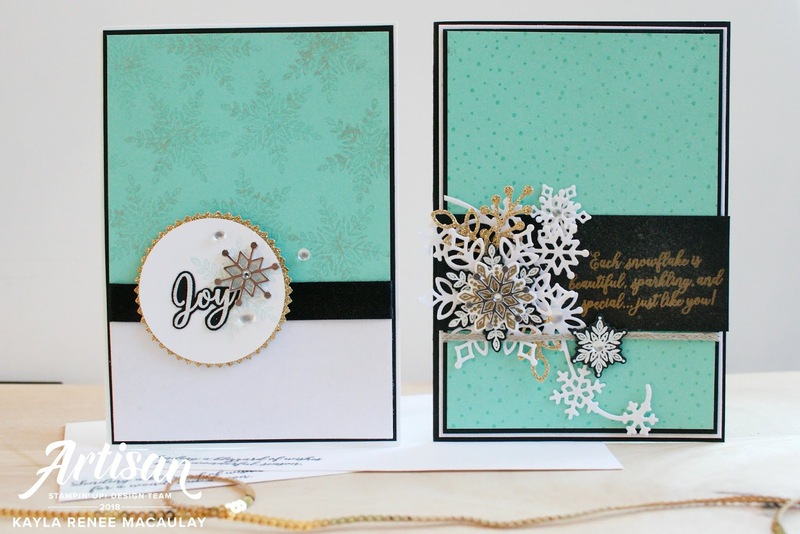 I also used the shimmer paint in one of our great Stampin’ Spritzer bottles to add some shimmer and shine to the card on the right on the basic black sentiment piece. 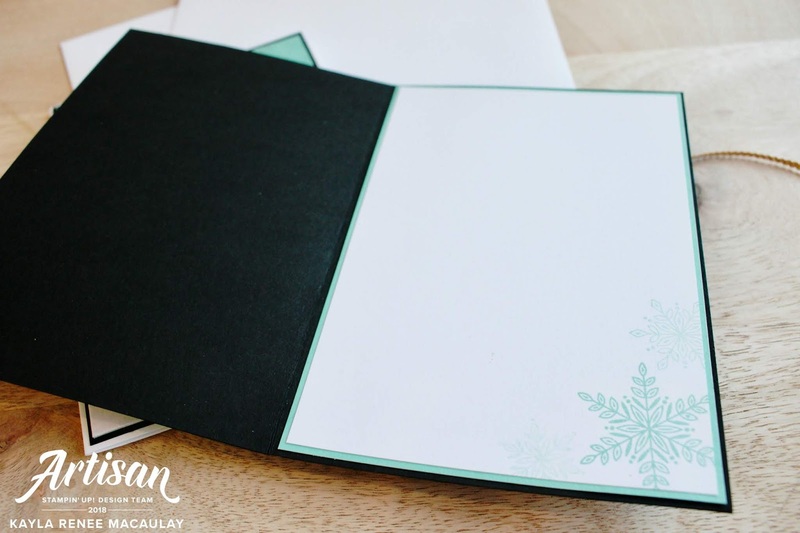 I added lots of embossing with the White Stampin’ Emboss Powder directly onto some Basic Black A4 Cardstock and love the bold look it gives the cards. 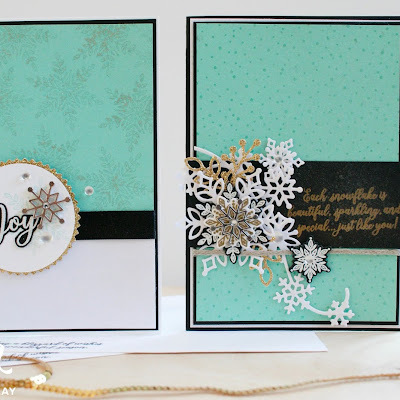 To top it off I added the gorgeous Snowflake Trinkets to each card. 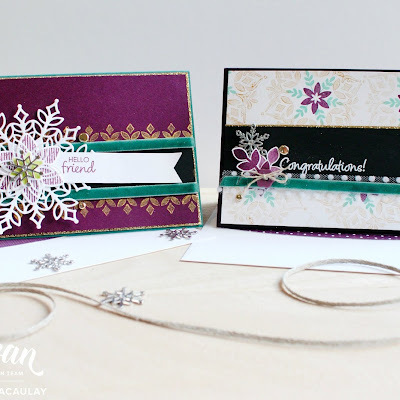 And a look at the completed insert which I stamped with one of the snowflake stamps in Coastal Cabana. Both inserts in both cards are the same. 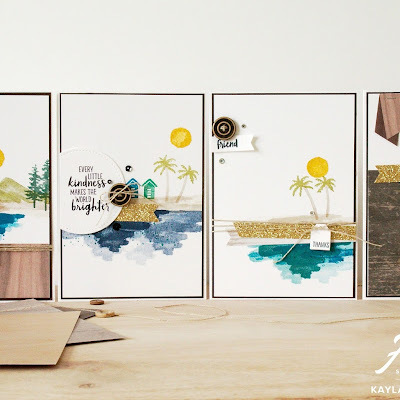 The next blog is the ever so lovely Kim McGillis with her gorgeous samples. Go and check out her gorgeous blog. 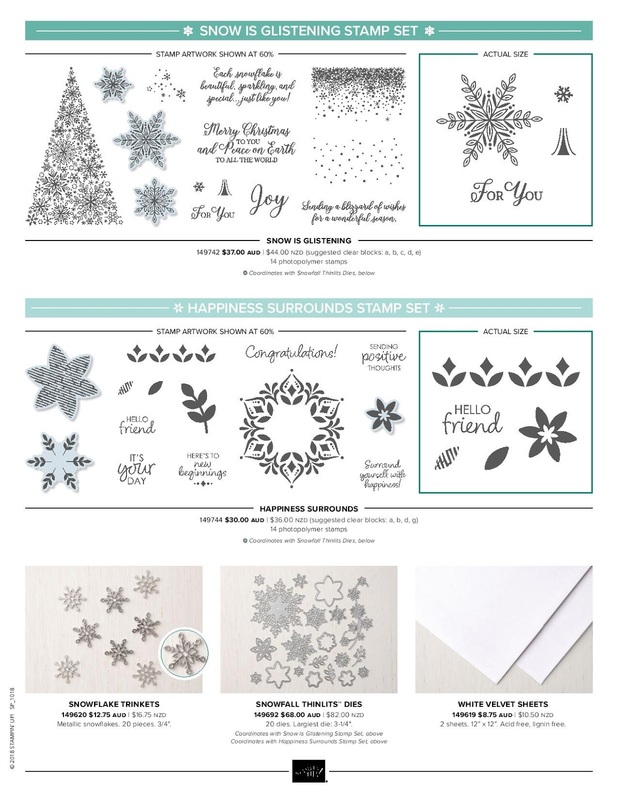 This month we have released a special LIMITED EDITION release of products used in this blog hop called Snowflake Showcase. You can order these great products right now and make some beautiful cards and projects. You can add these to an online or workshop order. Sign up as a demonstrator (with no expectations to sell, just sign up for a hobby) and get the lots for $169 with FREE shipping and an additional $78.50 FREE to spend on whatever you like. You can join my team here. I hope you enjoyed this blog hop today and got lots of ideas to use this great special release bundle of products. Be sure to check out all the blogs for lots of inspiration.